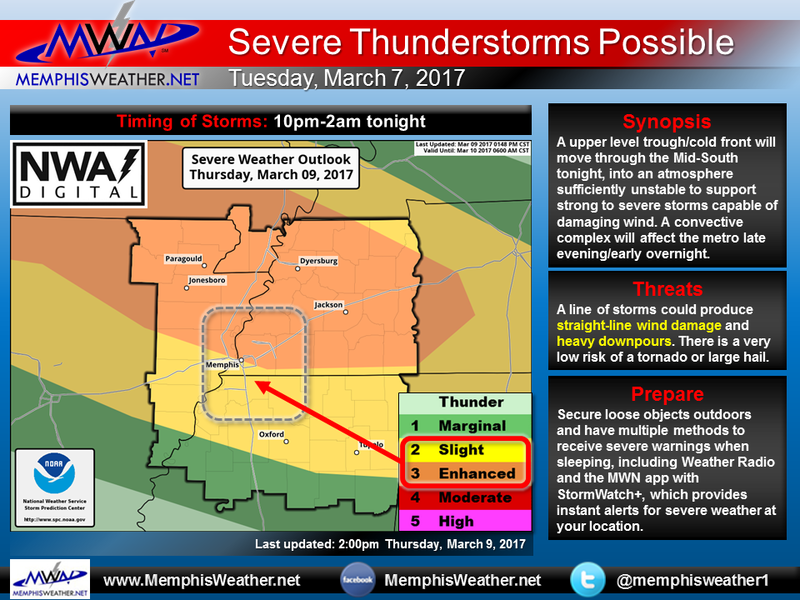 MWN Blog: Before possible winter weather, strong to severe storms! Before possible winter weather, strong to severe storms! A complex of storms will move out of southern MO/northern AR across west TN with a line of storms likely dropping southeast into the metro after 10pm, and probably closer to midnight. Storms will be capable of very strong wind gusts, though it appears the highest risk of damaging wind will be just north of Memphis, say across Dyersburg to Jackson. Small hail is possible and a quick spin-up tornado is also possible, but certainly not likely. Rain could be torrential for short periods as the line moves over your location. We recommend you secure anything outdoors that you don't want to blow away and then set your weather radio and/or StormWatch+ in your MWN app to alert/wake you if there is a threat of high wind at your location. We'll be up late, tweeting and Facebooking the details as it moves through. Grab those links below if you aren't already following us (and of course you can get to them in our app as well). In case you're wondering, we're still monitoring Saturday evening for the possibility of s--w. (Some people got confused when I use s--- in yesterday's blog, so I've clarified a bit.) Yes, there is still a real and decent chance of some s--wflakes. Better chances, especially for accumulation, are on the northern fringes of the metro and points north. We'll have more on this later. In the meantime, if you aren't enjoying today's mid 70s, do so. We won't see 70s (or probably 60s) again for a week and there are multiple mornings we could get frost and or a light freeze starting in a couple days. If you have Saturday plans outdoors, expect it to be RAW and rainy. Here's our forecast.